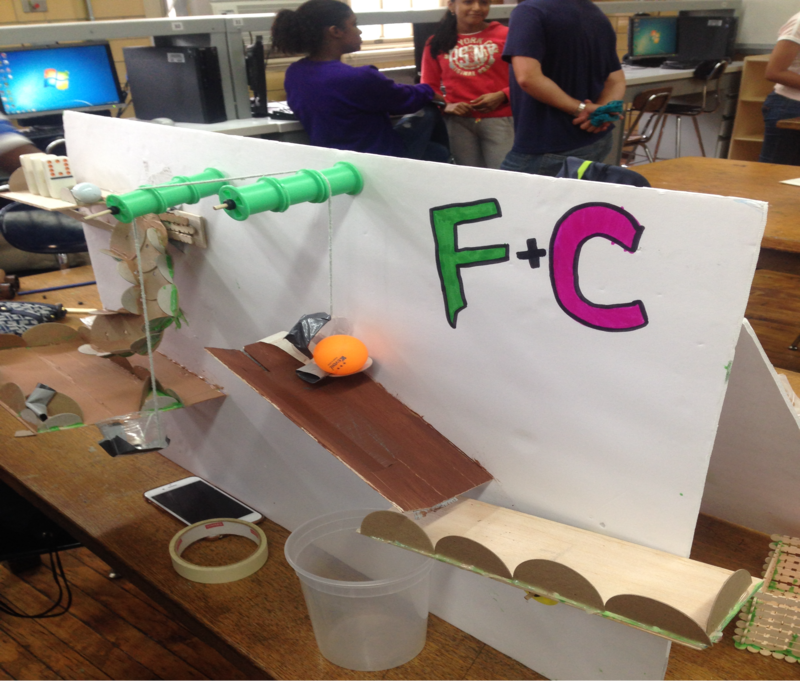 MIddle school students created Rube Goldberg machines as part of an innovate STEM and SHSAT prep program at Brooklyn Tech. Many middle school students spend tremendous amounts of time on test prep for the Specialized High School Admissions Test (SHSAT), with “drill and kill,” pencil and paper exercises, lectures and practice tests. A new test prep course run out of Brooklyn Tech High School takes a different approach, combining traditional lessons with fun, hands-on projects–like programming robots to traverse a maze, or build bridges and towers out of toothpicks. It’s showing positive results, both in the engaged participants and also into their acceptance into specialized schools. Of the 80 to 85 percent of students who finish the two-year course, about 70 percent are admitted to a specialized school, according to program administrators. Eligibility for the course is limited to about 15 Brooklyn middle schools, but its methods have the potential to reform other test prep programs. The Brooklyn Tech STEM Pipeline is run in partnership with the Brooklyn Tech Alumni Association to help underrepresented youth become leaders in STEM fields. Although one goal is to prep students for the SHSAT, an equal emphasis is placed on exposing them to interesting applications of math and science. “It gives me a lot of different opportunities for STEM stuff that I wouldn’t ordinarily do,” said a participant from MS 88. The program includes middle schools such as Fort Greene Prep and Lenox Academy that serve populations that are under-represented at the specialized high schools. Course organizers reach out to guidance counselors with a goal of getting two kids from each of the schools, including girls and Latino and black students, for about 30 to 36 kids each year. Students from a few so-called “feeder schools” such as Mark Twain School for the Gifted and Talented and MS 51 are also participants. Including some students from these highly selective schools better simulates the environment of a specialized high school, and helps to “up the level” of the class, said Elizabeth Sciabarra, executive director of the Brooklyn Tech Alumni Association and former head of admissions for the Department of Education. Students begin in the summer after 6th grade, continue into the school year with Saturday classes, and finish in March of 8th grade. Each day’s classes run for about four hours, with students attending 20 classes each summer and 25 each school year. Half of each class is spent on traditional test prep, and the rest is devoted to hands-on basic engineering and mathematical lessons, usually led by Brooklyn Tech teachers. After spending a week on one subject, students apply what they’ve learned with a project. We saw one such project, with teams of students using engineering principles to build Rube Goldberg machines. The machines were impressive, using levers, pulleys, dominoes, intricate cardboard pathways, and even toy cars to maneuver a ping-pong ball into a plastic cup. Even more impressive was the level of enthusiasm the students displayed. Participants were intensely focused on fine-tuning their projects, and excited to demonstrate their creations. “I like the engineering and learning how to work on different designs,” one girl said. Looking for a low-cost or free option to help your middle-schooler get ready for the SHSAT? Check out our InsideTool on the SHSAT.